Just out on the 360 this game came from nowhere and attracted some interesting press. Most couldn’t believe that the developers behind Grand Theft Auto had picked of all sports Table Tennis to be there next game. It was also pretty unique in that it focussed mostly on online play with very little for the solo player. To be honest it was picking up fairly average press. Now that it’s released it’s quickly become one of my favourite games for the 360 so far. 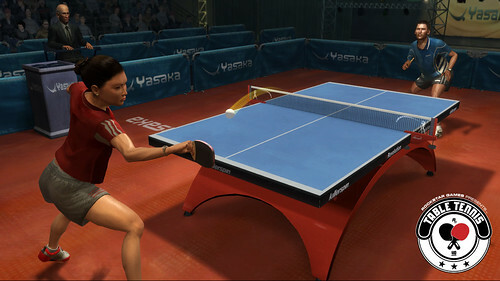 It focusses clearly on the game of Table Tennis so has none of the fluff that other sports games have – character creation, career modes, upgradable characters. There are characters that you can unlock playing the off-line tournaments but that is about it. The controls are simple yet offer tremendous depth during both off and online play. This can be summed up with the length of the rallies – my highest so far is around 80 strokes. Each point can take a long time to win and it captures the feel of Table Tennis – it’s hard to tell when you’ve got your opponent beat especially with the different spins that can be applied to the ball. Online play is excellent and there is very little lag. Playing Graham online provided one of the very few ‘in the room’ experiences we’ve had – there was nothing to suggest we weren’t playing on the same machine. The little lag I have seen was due to my opponent having an average connection. Graphics are good but limited in that there is very little to see. Sound – great for what there is but again there’s not a lot there. Presentation – I think it’s slick and it has the usual Rockstar stat collecting options so you can see fastest shot, length of time played etc just like in GTA. It’s the ease in which you can pick up the game and just start playing – no need for endless character face building options, career setup’s, money buying/training which can get pretty tiresome. It’s also very fast and requires a lot of concentration – if you like Geometry Wars you’ll love this. All at a bargain Â£25 if you order online means it’s a must buy for 360 owners. The official website is great too.